Our Community. Our Hospital. Our Health. Repurposing the footprint of the old Surgery Center and Emergency Department and incorporating adjacent space, we will create a 20,000-square-foot diagnostic hub that supports state-of-the-art imaging, all within our hospital’s current footprint. Improvements include new equipment, remodeling, expansion, and a seismic upgrade. This campaign is the critical next step in the master plan initiated with the 2014 renovation of our hospital’s Emergency Department and Surgery Center. 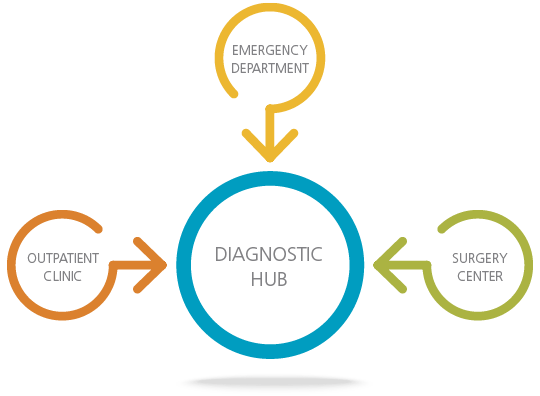 The foundation is now in place for the next phase of innovation: a central diagnostic hub to support every aspect of hospital care, from emergency to surgery to outpatient medicine. Today, some of our hospital’s most important capabilities — CT scan, MRI, X-ray — are outdated or inadequate and must be replaced or augmented. If we don’t correct these shortcomings, our hospital won’t be able to provide the best care for us today. As patients seek top-notch diagnostics elsewhere, our hospital will lose revenue and may not be sustainable to serve us tomorrow. This project is our chance to create an exceptional hospital that is a resource for Sonomans of all ages and stages of life. We will have a hospital that is technically excellent, accessible, and — with advanced diagnostic capabilities that contribute to our hospital’s bottom line — stronger financially. Our desire for good health requires the best health care, and Sonoma Valley Hospital has served us well for more than 70 years. But medicine has changed a lot in that time. It’s time to update one of the most important features of our hospital – the facilities that, using advanced imaging technologies to see inside the body, diagnose what ails us and help us stay healthy. Connect with us about the campaign for Sonoma Valley Hospital.